The next Basingstoke District Practice will be at Deane on Saturday 13th April from 10:30am until 12pm. If you are going, please park on the road outside the gate to the church; parking is not permitted on the drive or the small church parking area. Congratulations to Matthew Dancy – First Peal! Huge congratulations to Matthew Dancy on ringing his first peal at Selborne today. Matthew only turned 14 last month and has been learning to ring at All Saints, Basingstoke, Newnham and more recently at Bishopstoke. In the peal where his Mum, Margaret and Grandpa, Ian making Matthew the third generation of the family to ring. Grandma Ann was on hand too for band photos but declined to ring in the attempt. Matthew rang really well throughout and only gave a hint of a teenage smile as the peal cane round. Let’s see if he can beat Grandpa Ian’s total of over 3300 – a little way to go! The Education Committee’s first course for this Autumn is Plain Hunting and Trebling to Doubles Methods, which will take place on Saturday 13 October 2018, based at Church Oakley. A poster and application form (both Word and pdf versions) are below. As always – any queries, please let me know. A group from the Basingstoke area, led by Vice-Master Pete Jordan, toured the Island last Saturday and spent the day ringing at six of our towers. Among those rung were Freshwater, Brighstone and Godshill . Final ring of the day was Ryde with its heavy 26.2cwt. 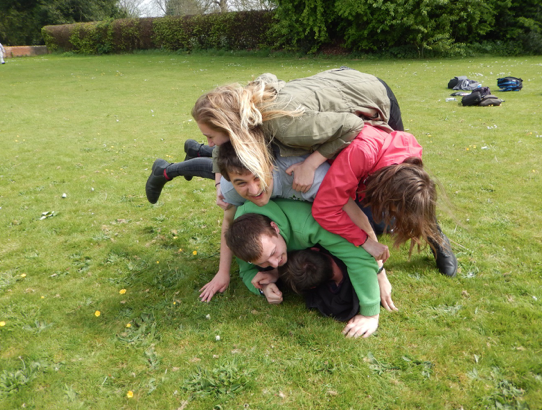 I found them all gaining sustenance for the last tower of the day eating fish and chips on the church lawn! The group set sail from Cowes as the sun was setting. I hope you all enjoyed your day ‘overseas’. The May Basingstoke District Practice is at Wolverton on Saturday May 19th at 6.00 – 7.30 pm. Wolverton is a delightful 8cwt 6 with bells that ring themselves! And ..to the pub after to quench the thirst and for a social! Do join us. Saturday 14th April – St Martin’s, Ellisfield, RG25 2QR. 12.00 pm – Lunch at The Fox, Ellisfield, RG25 2QW. Everything rung from calls & round changes to usual doubles methods. All welcome to join in, the day is broken up so you can join in for whatever part you wish! How good it that! Basingstoke District Practice Sat 18th Nov. 3.30 at Crondall. Basingstoke District Practice Saturday 18th Nov. 1530 – 1700 at Crondall. If anyone knows of someone that would benefit from a Stedman Doubles practice on Saturday 11th November 2017 at Herriard from 10:30 – 13:00 please would you pass on this information and ask them to get in touch with me as there is available space for an extra student. There will be no practice at Overton on 6th or 13th October. By popular demand, I’m organising another Stedman Doubles practice. The practice is to be held on Saturday 11th November 2017 10:30-13:00 at Herriard. For this event to be successful we need volunteers to help the students. Please help if you can. Your presence will be much appreciated for a successful practice. The Basingstoke District outing is in the area to the south of Stockbridge on Saturday 16th September. We will be sending a pre-order, so please could you let me have your lunch choices by MONDAY 11TH SEPTEMBER http://www.hatchetinn.com/menu.htm. Saint Mary the Virgin, Micheldever held a Stedman and Erin doubles practice on Saturday 8 July 2017. The training day was brilliant. 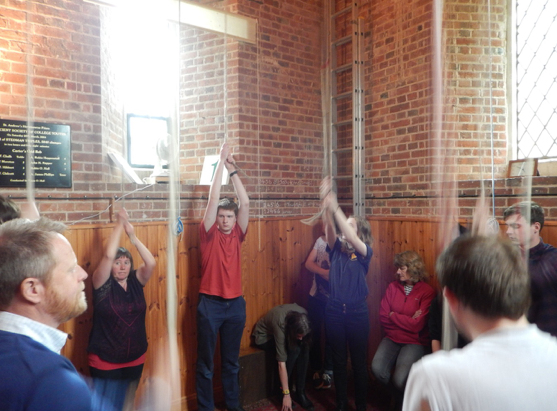 Great support from local ringers and an opportunity to meet new people and have some extended quality rope time. Personally this session really helped me consolidate my Stedman learning resulting in me completing a touch of Stedman and completing a plain course of Erin which was a first for me. On the day I met Deb Baker, and we decided to arrange a training day for Cambridge Surprise Minor. Debs arranged the bells and I looked to gather a team of helpers. Last Saturday 26th August (bank holiday weekend) two students and nine helpers from across the district undertook Cambridge Surprise Minor simulator practice at Crondall. Initially the students took turns ringing the method before we advanced to having two students in at the same time. The practice culminated in Debs and me ringing three plain courses together, which was a challenge but completed with some guidance on the second and third courses. It was a brilliant three hour practice with the students walking away with much more knowledge and experience than they had started with and I think the helpers had a good time too. For a bit of fun the practice finished with a round of quacking ducks on the simulator. If you’ve never tried it you should, it was very funny! Finally thanks goes to Crondall, for the use of the tower. A big thank you to all the helpers for making this practice such a great success and thanks goes to Roy LeMarechal, who kindly acted as tower captain and structured the practice on the day. I wrote some weeks ago about a Cambridge Surprise Minor Simulator Practice at Crondall on Saturday 26th August 2017 10:30-13:00. The practice is still planned to go ahead and if you are able to come along as a helper and support the students your support would be much appreciated and valued. There will be no practice at Overton on the 11th and 18th August. The Eversley Surprise Minor practice is held on the last Wednesday of the month, 8pm until 9.30pm. White Hart Pub afterwards. On Wednesday 28th June we held a very enjoyable Surprise minor practice at St Mary’s church, Eversley (Basingstoke District). The practice was well attended by ringers from the district, our ODG neighbours and by St Mary’s new Curate, the Reverend Rachel Hartland. Rachel hadn’t rung for 15 years and was delighted to join in with some rounds to get her back into ringing! This month’s method was Annable’s London. Cambridge, Norwich, Beverley and Primrose were also rung. The practice gave St Mary’s ringers a chance to practice Treble bob, Treble Bob Hunt and Plain Bob Doubles with the benefits of a strong band. Our thanks to all those who attended. The Eversley Surprise Minor practice is held on the last Wednesday of the month. The next practice will be on 26th July, 8pm until 9.30pm. White Hart Pub afterwards. Holy Week. No Friday practice at Overton. Easter Day 09.55 for 10.30 service. No ringing at Laverstoke.